Find the unique element ID of the Paragraph Text element, see Finding the unique element ID. 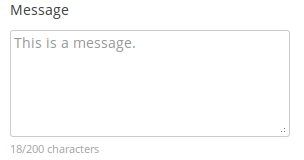 On line 4, replace 200 with the maximum number of characters you want to allow. On line 7, replace iphorm_1_1 with the unique element ID, from Step 1. You can style the character counter, by adding the following CSS style to your site and customizing it to suit, see Adding custom CSS.